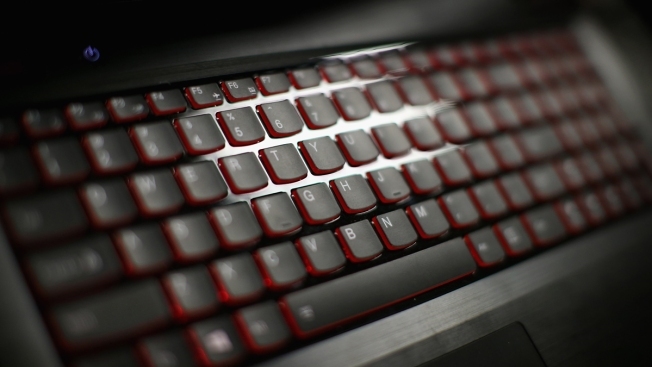 A computer keyboard is shown in this file photo. The game is branded as a "SWAT simulator." Bluehost was asked to remove the sites in an online petition organized by Sandy Hook Promise. The game also was recently condemned by parents of children killed at Marjory Stoneman Douglas High School in Parkland, Florida. The developer of a school-shooting video game is vowing to continue selling it online as parents of slain children and other mass shooting victims work to get the game wiped off the internet. The "Active Shooter" game was created by Anton Makarevskiy, a 21-year-old developer from Moscow, Russia, and is being marketed by his entity Acid Software. Acid said in a Twitter posting Tuesday that it will not be censored and cited free expression rights. The game is branded as a "SWAT simulator" that lets players choose between being an active shooter terrorizing a school or the SWAT team responding to the shooting. Players can choose a gun, grenade or knife, and civilian and police death totals are shown on the screen. Acid had been selling an early version of the game online for $20 and plans to release a new version next month. Acid recently set up two websites for "Active Shooter" after the game was removed from the webpages of video game marketplace Steam and crowdfunding site Indiegogo, which is refunding contributors. The removals followed complaints and online petitions by anti-gun violence advocates including parents of children killed in school shootings in Parkland, Florida, and Newtown, Connecticut. "You cannot censor us and what we do," an Acid Twitter posting said . "Our game does not violate any ToS (terms of service) nor promotes any violence and/or extremism. #ActiveShooter will remain on our website and continue its course!" One of the sites included a discussion section where one person recommended adding more "blood from shot civilians (LOTS AND LOTS)" and increasing noise and chaos to add to "the drama." The new webpages, however, were shut down Tuesday night by Bluehost, the Burlington, Massachusetts, company that hosted the new sites, according to Acid, which vowed to get them back up and running. Representatives of Bluehost did not return a message seeking comment. Bluehost was asked to remove the sites in an online petition organized by Sandy Hook Promise, an anti-gun violence group formed by parents whose children were killed at Sandy Hook Elementary School in Newtown in December 2012. Twenty first-graders and six educators were shot to death at the school, including Nicole Hockley's son, Dylan. "Even more than five years later, I'm still not ready to face all the details of Dylan's last moments," Hockley said in an email urging people to sign the petition to Bluehost. "The fact that someone has programmed such details into a game for others to play is beyond sickening." Ata Berdyev, of Seattle, who is helping Makarevskiy promote the game, told The Associated Press in emails Tuesday that the new sites generated about 300 free downloads of a demo, 14 sales of the initial game version and four pre-orders of the new version in less than a day. Berdyev said Makarevskiy "does not keep up with US news" and the release of the game was "just a bad timing." "He obviously expected some criticism, but not as much as it got," Berdyev wrote. "It's a video game, not reality. It also does not promote any violence or hate. People need to focus on real-life issues rather than a video game. There are lots of other games which are even worse, but people seem not to care as much."